The economy of the United Arab Emirates (UAE) is only expected to grow marginally in 2019, according to ratings agency Moody's. It has forecast GDP growth of 2.8 percent this year, up from an estimated 2.6 percent growth in 2018. Speaking at a media briefing in Dubai on Tuesday, analyst Thaddeus Best said that headline growth would be "constrained" this year, which is partly due to the production cuts agreed by the 'OPEC-plus' group of producers, although its overall production allocation could be slightly higher than last year. Growth in the non-oil economy is predicted to be slightly more robust at 2.9 percent this year, up from an estimated 2.4 percent in 2018. "In terms of non-oil GDP, we are forecasting a modest acceleration," Best said. He argued that the main driver for the economy would be the expansionary fiscal policy set, most notably in Abu Dhabi. "But at the same time, I think we see a lot of pressures particularly in some of the key industries," Best added. He cited tourism as one industry facing challenges, with Dubai reporting only marginal growth in 2018 after several years of strong improvement. Dubai's Department of Tourism & Commerce Marketing said last month that the emirate received 15.92 million overnight visitors in 2018, up 0.8 percent on 2017's figure of 15.8 million. "We've seen a lot of weakness in the currencies of key source markets like the U.K. and India, we've had a strong U.S. dollar (the UAE dirham is pegged to the United States dollar). Those factors, I think, have played into a more challenging environment for the tourism sector." The real estate sector also remains weak, with Moody's warning on Tuesday that it expects the market to remain in decline for 12-18 months as supply continues to outstrip demand. 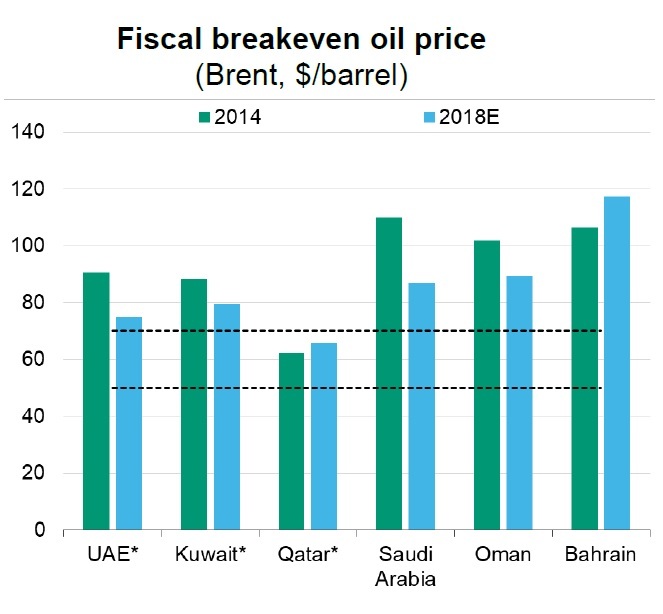 Alexander Perjessy, a senior analyst at Moody's said that the ratings agency had revised its oil price forecast downwards to $62 per barrel of Brent for 2019, which means that it now expects both the UAE and Qatar to run budget deficits this year, instead of surpluses. It said that in the medium term, it expects oil prices to be range-bound between $50-$70 per barrel - a range which means all GCC countries barring Qatar will be running persistent deficits, based on current spending levels. Perjessy said that Kuwait is set to run the biggest deficit of around 12 percent (after investment income and transfers to its future generations fund). Oman is set to run a deficit of 10.9 percent, and Saudi a deficit of 5.6 percent. Both of these nations are also predicted to experience slower growth in 2019, with Moody's forecasting overall GDP growth of 1.8 percent for Saudi Arabia, down from 2.2 percent last year (although non-oil growth is set to jump to 3.6 percent, from 1.6 percent last year). Overall GDP growth in Oman is set to slow to 1.5 percent, from 2 percent last year. The sultanate's sovereign credit rating was downgraded earlier this month to junk status. Perjessy told Zawya on the sidelines of the media briefing on Tuesday that this was due to the country's "somewhat slower progress on fiscal reforms than we had expected a year ago", citing delays to the introduction of value-added tax until next year, and delays to a new excise tax. He added, however, that the Sultanate's fiscal position was healthier than Bahrain's had been last year, when the kingdom faced a crisis of confidence among investors that caused the cost of insuring its sovereign debt against a default to rise markedly. Bahrain was eventually offered a $10 billion package from GCC neighbours Kuwait, Saudi Arabia and the United Arab Emirates to support its economy. "The key difference is the size of external and fiscal buffers that Oman can rely on," Perjessy said. Prior to Bahrain facing stress in international capital markets, it had $2 billion of foreign exchange reserves, with $750 million of debt due for redemption last November. "In Oman, there are no large redemptions coming up before 2021, whereas Oman's central bank reserves are $17.5 billion, plus Oman has possibly up to $15 billion of liquid foreign exchange assets in the sovereign wealth fund," Perjessy explained. Overall GCC GDP growth is forecast to stand at 2.1 percent in 2019, up from an estimate of 2 percent for last year. Speaking about the UAE economy during a panel debate at the Global Financial Forum on Monday, Shayne Nelson, the chief executive of Emirates NBD, said that the country was feeling the effects of its peg to the U.S. dollar. Although he said he was not advocating a break of the peg, "At the moment I think we're in a situation where the economy is being hurt by the strength of the dollar, and therefore the dirham". He said that the UAE was competing with neighbouring economies whose currencies are depreciating against the dollar. "Even if property prices remain stable (in the UAE), if you're an Indian they've gone up 10 percent. We are seeing Dubai as a place at the moment that feels expensive for tourists, for investors," Nelson said.